Outfits for my LA Weekend. For today’s post, I was planning on doing a Halloween makeup tutorial but my skin has been acting up. I don’t know if it’s from stress or lack of sleep, but it’s not looking too pretty. I went to see my esthetician on Tuesday and let’s just say, my skin is a bit sore from the extraction. So that blog post is going to be rescheduled for next week. For today’s blog post, I thought it would be nice to show you what I am planning to wear for this weekend because I am going back down to the LA area #WhatElseIsNew I’m really excited to see my best friend, Cara; I haven’t hung out with her since August and we are going to Disneyland! #Again I know I went last month but this time, we are going to a pre-bachelorette party for one of my besties, Brittany! And on October 17th, we are going to see Florence and the Machine perform at the Hollywood Bowl!! I will be Anaheim around the evening time, so I am bringing a spare outfit. I was looking at the weather and it doesn’t look like it’s going to be cold. I am going to bring a pair of jean shorts, a chambray shirt, a buckled belt and small leather backpack. Call me the 90s child. Cara is scheduled to work during the day, so I am planning on going to a coffee shop to study for my Marketing exam. She lives near the beach which can make it challenging on what to wear since some shops don’t have air conditioning. 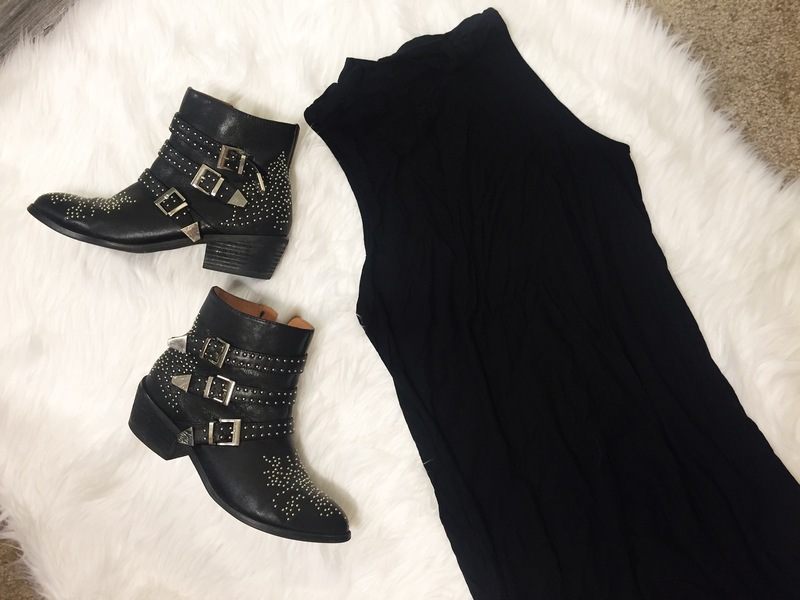 I am planning on wearing my short black Topshop dress with my leather boots. I’m hoping I can wear this for Florence + the Machine, but if it gets cold, I’ll probably wear a jacket with it. Let’s be honest, I love dressing up but I would rather be comfortable when driving back home. Workout clothes are the most comfortable thing to wear when you’re sitting in a car for 4 hours. I always bring a pair of Birkenstocks when I travel; they’re my ugly comfort shoes. Call me basic but at least my feet won’t be cramping. I used to own a pair of Birkenstocks when I was a kid but I definitely need to get some again!